An intrauterine device (IUD) is a contraceptive device which is inserted directly into the uterus. 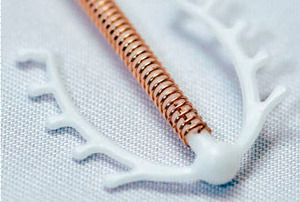 These devices are employed primarily for long-term contraception. However, copper models may be used in an emergency. Effective lifetime ranges from two to 10 years, comparable to that of contraceptive pills. - Copper versions take advantage of that metal's spermicidal qualities. The uterus also treats the IUD as a foreign body, which prevents implantation. Its use may lengthen the menstrual period. - Hormonal models release progestogen into the uterus. They are not suitable for emergency contraception. Possible side effects are the same as those caused by birth control pills, including disappearance of the menstrual period, bleeding and weight gain. Choice will depend on the individual user. Period length, allergies, weight problems, acne and other factors should be considered.